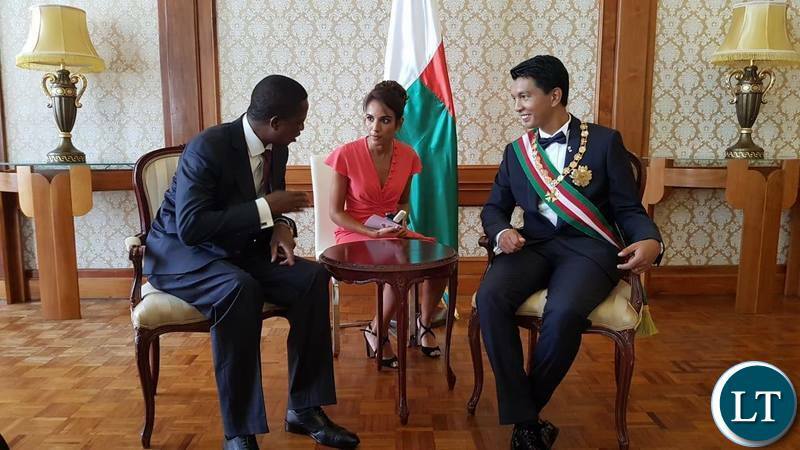 President Edgar Chagwa Lungu has assured Madagascar of close cooperation with SADC. Speaking when he met newly inaugurated President, Andry Rajoelina in Antannarivo in Madagascar. The two met in a bilateral meeting at the country’s State House. Earlier President Lungu attended a colorful inauguration ceremony attended by thousands of Malagasy people held at the Municipal Stadium in the City. 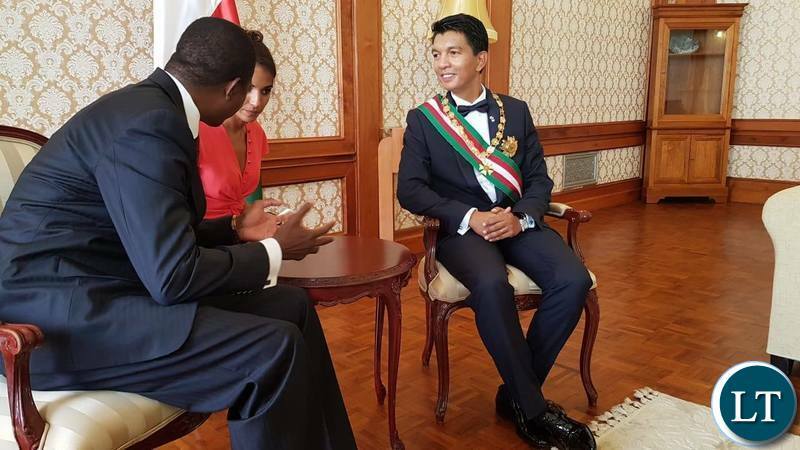 President Lungu was in Antananarivo to attend the inauguration of President-elect Andry Rajoelina. President Lungu in his capacity as Chairperson of the SADC Organ on Politics, Defence and Security Cooperation has been deeply involved in the processes leading to the election of Mr. Rajoelina. Zambia’s High Commissioner to South Africa, Emmanuel Mwamba who is also accredited to Madagascar, confirmed that President Lungu attended the ceremony graced by regional heads of state and government. He said Madagascar was a key partner to the SADC region and was the current chair to the trade member states’ body ,COMESA. He said that a project to send Zambian teachers of English to Madagascar would commence after the new government takes office. Other heads of state that attended the inauguration ceremony included SADC chairperson and Namibia’s Peesident, Hage Geingob, Ghana’s President, Nana Akufo-Addo, Ethiopia’s President Sahle-Work Zewde and leaders from Syechelles, Mauritius and France’s former President, Nicholas Sarkozy. Lungu should just connect straight to Kinshasa for DRC inauguration then keep finding other inaugurations, presidential funerals or weddings so that he keeps globe-trotting till 2021.
instead to coming bk to Zambia. Lungu, poor sitting posture like you’re begging for a loan already. Look at that Madagascar ‘s presidential Advisor, so beautiful, and she is smearing good!! . Who does Ba Edgar has? More than 50 years after independence we have no interpretors of our own? Why assure Madagascar (or as LT calls it Madagscar) of close cooperation with SADC? Aren’t they part of SADC? Ba LT vozilembela ni so cabe kalembedwe ka ulesi masiku wonse! There he is making assurances abroad as if they care…meanwhile at home there was inter party dialogue; the lazy bum has run away to make assurances on behalf of SADC, no wonder the young man is looking at him as a clown who has too much time on his hands and lacks responsibilities. This is the reason he flew in from Addis to Lusaka for 24 hours to go and play in Madagascar whilst his Chawama wife Ester is preoccupied in US. Andry Nirina Rajoelina only 44 years old… is a Malagasy businessman and politician. He started his career in the private sector, first organizing events on the Island, and then investing the advertising business and the media. Compare that to Lazy Lungu’s profile who was barred by LAZ for fraud. @Jay Jay, in that you are wrong. You can’t compare that Madagascar DJ with Edgar. Ka Rajorina is just a TV celebrate, there is nothing you know about him. Edgar even sold some government companies. He has 4 ministries under Sata while saving as PF secretary general. No no no guys please! Ok since lungu fancies himself as the peacemaker in SADC , let’s see him sort out the Zimbabwe crisis , or is that part of the SADC despot tin dictator unwritten verse….. Here is some of lungus itinary for 2019..
It’s gonna be a Marco Polo year. Where s the presidential jet? Don’t forget lungu also needs to justify his stolen wealth…..travel allawances are one way he can justify how he was become one of the richest men in Africa…. Madagascar is broke, before you guys get too happy kikikiki. SADAC is a toothless bulldog. There is not one credible thing that they have done. Globe trotters more like.